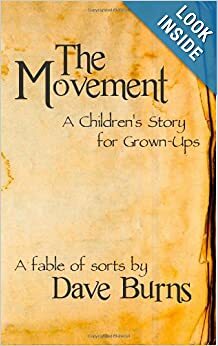 The Movement: A Children’s Story for Grown-ups is the tale of a little clockwork man and his search for the Maker and the cruel joke. Told by the narrator in a ‘sitting around the fireplace enjoying a warm cup of cocoa’ sort of way, the reader embarks on a journey through a wondrous land inhabited by wondrous creatures. Yet, the reader soon discovers that the wonder of these creatures is blanketed in a thick comforter of despair brought on by the cruelty of the joke. Audiobook Now Available: Amazon.com, Audible.com and iTunes! This book was truly Inspired. You know the story but you haven’t heard it this way before. When you come to it with the perspective of a child, it makes more sense. If you ever wondered what would happen if C.S. Lewis met Lewis Carroll, or even if you haven’t, then you’ll want to pick up this book. This book is whimsical and wonderful! It brought out my ‘inner child’; the wonderment, excitement and imagination that has been tucked away. Although written in a childlike format, the underlying lesson is one we all need to hear [and share]. This was a very thought-provoking little book. I read it in one sitting, it is short and kept me turning the pages. It was fun to read, written like a children’s book but with a much deeper meaning underneath. Buy it, and share it with friends! Warm and whimsical and surprisingly deep! The author takes you on a journey that feels comfortable and enjoyable and then you begin to realize that there is a much deeper meaning. You end this book wanting more and now there is a continuation available! : The Movement: Concluded: The Completed Anthology. I bought the paperback first and then got my Kindle so have it in both formats. I highly recommend you get it and draw your own conclusion about the deeper meaning! I like this author’s creative approach to wording! “As clear and voicy as a voice could sound – a sort of low, gravelly voice, with too much hiss and not enough purr.” (Chapter 13) The conversational narration style makes you feel comfortable and at home in the book. Adorable little book, that I really enjoyed. Sent it to all my friends. I think you will enjoy it too. Happy reading. The little clockwork character and his two friends really made for engaging characters. I enjoyed the author’s simple style and the story was well-written, although the continuous reference to “dear reader” did get a little trying. Like all fables, there is a morality lesson. I liked that the author didn’t come across as pushy or preachy, but rather just let the story flow and allowed me to develop my own thoughts. I admit it, I’m a sucker for a good children’s story. I’ve dearly loved them since I was a young child myself, and maybe even more so as a parent, reading them to my own children. So what could be better – now that my kids are grown – than a good children’s story actually written for me to enjoy as an adult? The Movement was not only charming, but meaningful on a deeper level. Yes, Burns did use “Dear Reader” repeatedly, and some of his other devices became a bit predictable, but isn’t that even some of the charm of children’s stories? For me, at least, it really wasn’t a problem. (It was just warm, and comforting to be able to forget the adult world for a while and simply enjoy feeling a little bit like a kid again – even if I did have to read it to myself.) I thoroughly enjoyed it, and am thinking of getting the sequel now. If you’re wondering what types of stories I especially loved as a child, here’s a very short list: The Princess and the Goblin – George McDonald (and all the books in that series), Angelo the Naughty One – Helen Garrett, pretty much all of Beatrix Potter’s tales, The Boxcar Children, Eight Cousins – Louisa May Alcott, and many, many more that I’m sure I’ll think of as soon as I hit “submit”. As a personal fan of both the author and his works, I can honestly say this book is mind blowing. Imagine Alice in Wonderland, but for adults. Very creative and it is easy to read. I love it!!! Alan Caudle does a marvelous job of narrating The Movement, and it only takes a little over two hours to hear the story! After first reading the book, I arranged for my book club to read The Movement Concluded (includes 2 additional stories beyond this one) and we will enjoy having the author with us to discuss it tomorrow night! The author’s messages are profound. You will enjoy getting to know the characters as they discover their purpose along life’s path which leads us to discover the meaning in our life as well. Expect to keep thinking about the book long after you finish it. There is much symbolism to contemplate! Very spiritually uplifting! This allegory is about a little clockwork man who “wakes up” from the Void to find himself in a hopeless situation — the “cruel joke.” So he strikes out into the world to find the Maker and ask him about the cruel joke. As he travels and struggles to overcome obstacles, he is changed, and he changes his world. I really enjoyed this little book – a quick read, and really hard to put down. It reads, as it says, like a children’s story for grown-ups. It’s like crawling up on your grandpa’s lap and resting your head against his chest, his rumbly voice tickling your ear while he reads you a bedtime story. It comes complete with fun advice about when to stop for milk & cookies or when to go to bed. Yet tucked into the whimsical narrative are some rather deep spiritual truths (“it happens to us all, dear Reader, but the question is: Will we get up and try again, or will we stay in the mire?” p. 72). Also some of the most creative descriptions I’ve seen in a long time (“A kindness was in her eyes that matched the sadness and dared it to wrestle.” p. 67 or “Yes, it was that kind of dark — the kind that gets in your teeth.” p. 51). . The Movement is well written and draws you along as if you need to keep following. It’s like getting caught in an extremely strong undertow. You will survive. I immediately embraced the narrator because of his affection, warmth, and the use of dear Reader. It feels almost like your grandfather is telling you the story. The strongest line and I believe to be the best is ‘I am here.’ It means so much more than the three little words that it is. Great job capturing the essence of a trusted, paternalistic story teller, full of foibles and interesting ways of relating the story. I like the narrator’s indirect way of telling the story. The narrator wants accuracy, but his kind of accuracy is not in measurement nor science, but just the right kind of comparison. The narrator keeps me interested by letting out little important details at a careful rate. It’s important for the narrator to relate the story and for us as readers to understand it correctly, but a part of that entails little fun clarifications. The story piques our interest and keeps our interest by maintaining the mystery and we grow to trust the narrator and be comfortable with his voice. It’s an inviting voice; non-threatening. And the narrator speaks directly to us: “Dear Reader…” which develops a relationship. I’m interested to know if the narrator has a direct role in the story as well. If the narrator will play a direct role and thus is relating the story of what happened and how he was involved. Or, if it is the reader telling us the story because he/she wishes for us to learn something valuable. Either way, good voice and interesting to read. Good feeling all the way through reading it. Good job. Amazon Prime Member? Kindle Unlimited Subscriber? Read it FREE! No reproduction in whole or in part without the expressed written consent of the author.